“Too Asian” TALK BACK, is a response towards Maclean magazines article titled “Too Asian?”. The article was published in Maclean’s on November, 11, 2010 by Stephanie Findlay and Nicholas Köhler. The content of the article focused on students and their choice of enrollment in universities. The article suggested “white” students tend to keep from applying to certain post secondary intuitions due to the reputation of those institutions as being “Too Asian”. The article is an example of existence of overt racism in media and how media often tends to even subtly justify racism. The article reinforces “racial stereotypes and racial profiling” of Asians. It implies that Asians are resented for their academic involvement, “characteristics” and are “tolerated” by mainstream white society. 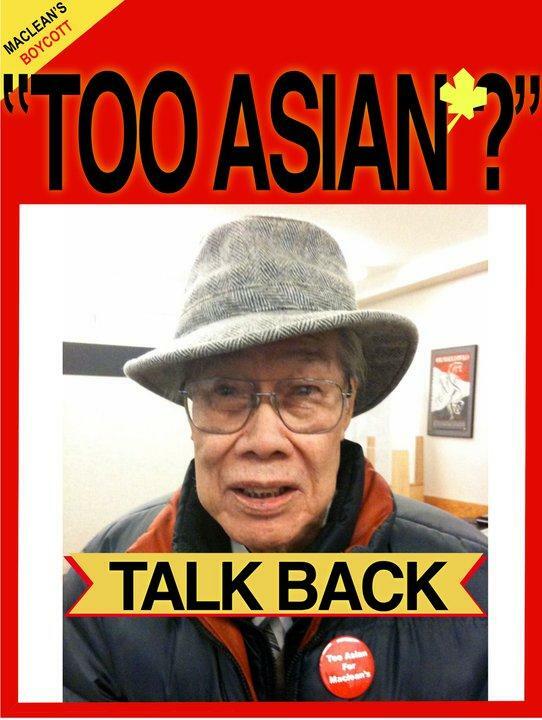 The community page can be found on http://www.facebook.com/TooAsianTALKBACK. Access to the article can be found on http://www2.macleans.ca/2010/11/10/too-asian/3/.